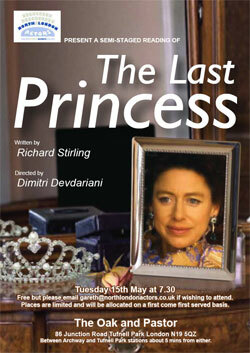 Richard Stirling's dramatisation of several hours from Princess Margaret's late life was a great surprise to me. A very English, slightly reserved play with a cauldron of fire or even fury at its heart... What a combination! Only four characters, but what characters! The author tells the story of an ageing heartbroken and yet brilliant and influential woman with great artistry. As a reader or an audience member you get drown into the narrative almost instanteniously and remain gripped until the very last word of the play. Margaret knows that everyone, even her supposedly faithful servants are there to use her. That knowledge makes her cynical and at times even cruel, but behind that demeanour there's a woman who was not allowed to love or truly be who she meant to be. Perhaps the fact that she is the only female character in the play makes her even more vulnurable and lonely. Sure, all the male personalities in the play have some kind of admiration for her, but she still is the prey, a victim allbeit in the indirect sense of the word. To me Richard Stirling's play is about vulnurability and solitude that comes with power and position. It warns us not to envy, or perhaps even desire high position and to be happy with what we have in life. Margaret's cutting, ironical lines are full of bitterness. Her brilliant intellect is wasted on verbal fencing with charming and not so charming strangers. Her sharp tangue is turned into a lethal weapon aimed at those who try to invade her and her family's privacy... Do we want to become like her? Do we feel sorry for her? Do we want to protect her? So many questions, and all of them profound! That is exactly why I believe that Richard Stirling's new play has a very interesting future.